COULD CANOLA STEAL THE SPOTLIGHT IN THE NEAR FUTURE? With almost 98% of the crop grown in the Western Cape, it was no surprise that the canola crop production would drop slightly from the previous year due to the drought in that region. During the 2017/2018 production season, the Western Cape was overcome by one of the worst droughts the region has ever experienced, resulting in a reduction of almost 20% of the overall winter grain tons produced across the country. In the recent 2017/2018 production forecast reported by the Crop Estimates Committee (CEC), canola is expected to reach total production of 92 400 tons, which is a 12% decline from the previous season. 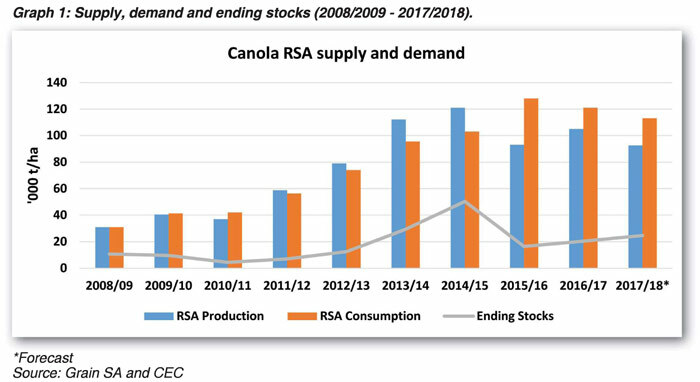 Over the years, on a long-term trend, local consumption of canola has been on a rise, particularly from the 2014/2015 marketing season which can partly be attributed to an improvement of the middle income class in South Africa. The increase in consumption was also mirrored by the recent increase in the area planted. In the recent production season, there was more canola planted in the Swartland compared to last year. The area planted to canola was 23,4% higher than a year prior, from 68 075 to 84 000 hectares. In fact, canola was the only winter crop that showed a significant increase in area planted this season; indicating that it is slowly beginning to compete with winter grains such as wheat and barley for production area. On average, the domestic consumption of canola amounts to 112 000 tons, with about 97% of the canola estimated for crushing of oil and oilcake. Based on the current estimates, the domestic consumption is however expected to decline by 7% from the previous season, mainly driven by a decline in the demand for animal feed and oil representing a decline of 59% and 7,3%, respectively. With no significant trade flows of imports and export, South Africa has only recently started importing canola in the 2016/2017 marketing season which once again points to a rising demand for the niche crop. In the 2017/2018 supply and demand estimates, imports of canola are expected to reach 25 000 tons which is an increase of 20% compared to a year ago. These imports, along with opening stocks would bring the total domestic supply of canola to 138 000 tons. Since production and consumption are constantly increasing, it brings to question how the crop will perform should drought conditions in the Western Cape persist. It is after all, in challenging times such as these that new seed technologies are adopted. Should the demand for canola continue to rise, there could be a need for new technologies to be adopted in order to keep growing production, despite climate change. Article submitted by Michelle Mokone, Agricultural Economist: Grain SA. For more information, send an email to: Michelle@grainsa.co.za.